The optional Self-Guiding CCD is moved from the main camera body to the new STXL filter wheel for guiding in front of the filters. A highly reliable rotating type even-illumination shutter provides a shorter backfocus to accommodate camera lenses. The STXL uses a new optional remote guide head. Same size as the ST-i Autoguider, but plugs directly into the remote guide head port of the STXL camera body and operates as an integrated self-guiding CCD. All STXL-11002 cameras include a rugged aluminum body with Ethernet and USB 2.0 electronics, Even-illumination shutter, -60 degrees TE cooling delta, water cooling ready, USB and Tracking Cables, Power supply, CCDOPS. The STXL uses the same efficient pin fin heat sink design as the STX series cameras to achieve the most efficient use of space and weight while maximizing the cooling capability of the camera. This type of heat sink is more expensive than typical parallel fin heat sinks, but the results speak for themselves. The STXL achieves a temperature delta of -60C in 5 minutes. 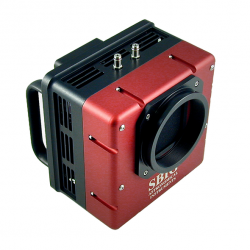 The next development in the SBIG STXL camera series is its even-illumination shutter. Since its founding, SBIG's mechanical shutters have been designed for highly reliable, even-illumination, of the sensor even at short exposures. Even illumination is especially critical when taking flat fields with exposures of less than a second or even several seconds. This is very common when taking sky flats. Internal image processing comes next and SBIG's new STXL is the first large format camera with user-selectable automatic image processing! Progressive 30-second dark frames were taken at room temperature to accentuate the number of warm pixels. One frame was unprocessed, the second frame has a medium filter, and the third frame the most aggressive filter. Each successive image shows fewer bright pixels and each has correspondingly lower noise in the image. The user can select from eight levels of filter strength to suit his needs. SBIG's STXL series cameras contain several innovative features that can be found in no other astro- imaging camera. This innovation extends to STXL accessories as well, including the integrated design of the FW8S-STXL and FW8G-STXL filter wheels. These filter wheels share common mechanical and electronic design, the only difference being the type of housing that is used as a front cover and some included items. Self-guiding has long been acknowledged as the best, most accurate way to guide long exposure astrophotos, particularly with commercial SCTs. The single most common complaint , however, s finding bright stars when guiding through dark or narrowband filters. The STT filter wheel incorporates a KAI-0340 CCD with 640 x 480 pixels @ 7.4u inside the front cover of the filter wheel so that the guider picks off light from the guide stars before passing through the filters. This guiding CCD is the same sensor used in the ST-i autoguider. Moreover, the optical elements that transfer the light from the pick-off mirror to the CCD act as a 0.7X focal reducer, similar to the OAG-8300 configuration. The result is a doubling of the field of view of the guiding CCD with a correspondingly greater selection of guide stars. Both the Standard and Self-Guiding versions of the STXL filter wheels incorporate the same micron-precision filter positioning mechanism as the STT Series cameras. When taking flat field frames of filtered images, the flat field frame must show exactly the same optical characteristics to be the most effective. If there is dust on the filter, or uneven illumination caused by the filter, this must be represented precisely as seen in the light image to be corrected by the flat field frame. The STXL filter wheel is designed to provide a new level of accuracy when taking flats through filters by repositioning filters to within a few microns every time. This allows the imager to take extremely accurate flat field frames even after rotating the filter wheel several times, or even after a loss of power. The light frame at top(see fourth photo) , taken with the new filter wheel design, shows a large opaque spot caused by debris intentionally stuck on a clear filter. The filter wheel was rotated several times, then the clear filter was re-positioned, and a flat field image was taken through the same dirty filter. The image at bottom left shows the result after applying the flat field image to the original light frame. We measured this positional accuracy to be better than 5.4 microns, or better than a single pixel using the STT-8300.